DESCRIPTION OF THE BOOK: When her family moved to the town of Westminster, California, young Sylvia Mendez was excited about enrolling in her neighborhood school. But she and her brothers were turned away and told they had to attend the Mexican school instead. Sylvia could not understand why—she was an American citizen who spoke perfect English. Why were the children of Mexican families forced to attend a separate school? Unable to get a satisfactory answer from the school board, the Mendez family decided to take matters into their own hands and organize a lawsuit. In the end, the Mendez family’s efforts helped bring an end to segregated schooling in California in 1947, seven years before the landmark Supreme Court ruling in Brown v. Board of Education ended segregation in schools across America. Using his signature illustration style and incorporating his interviews with Sylvia Mendez, as well as information from court files and news accounts, Duncan Tonatiuh tells the inspiring story of the Mendez family’s fight for justice and equality. 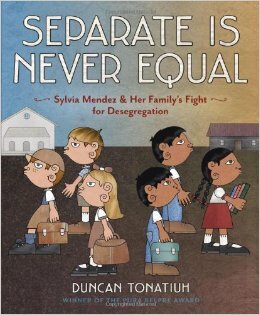 MY TWO CENTS: Kudos to Duncan Tonatiuh for shining a bright spotlight on a consequential, but often overlooked chapter of American civil rights, and bringing this true story of Latinos fighting for racial justice to young readers. The book features Tonatiuh’s trademark, award-winning illustration and his retelling of the facts. In the mid-1940s, when the action takes place, Sylvia Mendez is nine years old. She’s the daughter of Gonzalo Mendez, a Mexican-born, naturalized citizen of the United States, and his wife, Felicitas, from Puerto Rico. When the Mendez family moves from Santa Ana, California, to a farming community in Orange County, Sylvia and her brothers are not permitted to enroll in the neighborhood school and are instead sent to a school designated for Mexicans, which is farther from home. Unlike the white children’s school, it’s dirty, crowded and lacks a playground. The students eat lunch outdoors next to a fly-infested cow pasture. To top it off, the teachers seem indifferent, as if Mexican children weren’t worth the bother. After Sylvia’s parents successfully face down California’s version of Jim Crow laws, she enrolls in the neighborhood school, shattering longstanding color barriers. In the corresponding page spread, a white boy tells Sylvia, “You don’t belong here,” and Sylvia is shown with a bowed head and a tear sliding down her cheek. Reminded by her mother of the long fight they undertook to win her right to equal schooling, Sylvia perseveres, proving herself as steely as her parents. 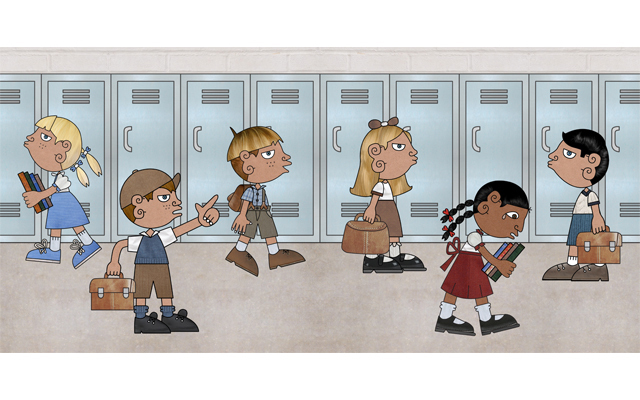 In the closing pages, she and other brown-skinned children are shown side-by-side with white classmates in the school playground. Tonatiuh’s account highlights the exemplary character of Mr. and Mrs. Mendez. Every movement for justice has its heroes and pioneers, and the Mendez family richly deserves that level of recognition. Taking up the fight involved considerable personal risk. They used their life savings to kickstart the legal fund. Eventually, they received wider support. Leading the charge took Mr. Mendez away from the farm for long stretches, leaving Mrs. Mendez to perform farming tasks that her husband normally would have handled. As the story shows, many Mexican families in the community declined to join the lawsuit, for fear of economic retribution. “No queremos problemas,” they said. The California campaign for educational equality, spearheaded by the Mendez case, ultimately led to the 1954 ruling on Brown v. Board of Education. The victory illuminated by Separate is Never Equal belongs in a clear line of prominent milestones of American civil rights. How fortunate that someone with Tonatiuh’s skill has brought it out of the shadows. TEACHING RESOURCES: Beyond the importance of the story, Tonatiuh’s groundbreaking illustrations deserve readers’ attention. His drawings marry childlike innocence with characteristics of ancient Mixtec art. (See my review of Pancho Rabbit and the Coyote: A Migrant’s Tale for a fuller discussion of his style.) In Separate is Never Equal, the illustrations take on the added dimension of historical details from the 20th century. Teachers may want to provide students with photographs from the era to demonstrate how carefully Tonatiuh researched and reproduced clothing, hairstyles, automobile models, and other authenticating markers of the 1940s. As is generally the case with nonfiction picture books, younger readers will likely need adult guidance to understand sections of the story that deal with legal proceedings and other points of the Mendez’s battle. This book presents powerful opportunities for teaching empathy and strengthening awareness of the pain that racism inflicts. One scene shows a public swimming pool with a sign stating, “No Dogs or Mexicans Allowed.” Mexican children look longingly through the fence at the white children frolicking in the pool. Teachers can pose discussion questions such as, “Imagine yourself on both sides of the fence. How would you feel in either situation?” Consider comparing Sylvia Mendez’s experiences with those of Ruby Bridges, the young African American girl who integrated New Orleans schools in 1960. A section in the back of the book includes an author’s note, a glossary, a bibliography and explanatory details about methodology. Much of Tonatiuh’s research came from court documents and extensive interviews with Sylvia Mendez. Glossary entries include a handful of Spanish phrases used in the book and historical terms that round out the context. One example is the origin of “separate but equal,” a phrase plucked from the 1896 ruling by the U.S. Supreme Court in the Plessy v. Ferguson case, which laid the foundation for decades of Jim Crow laws. In 2010, Sylvia Mendez received the Presidential Medal of Freedom. She is interviewed on this video, which highlights points of the story told in the book and shows photographs of her as a child and of the schools in question. Duncan Tonatiuh was born and raised in Mexico. He studied art in the United States. 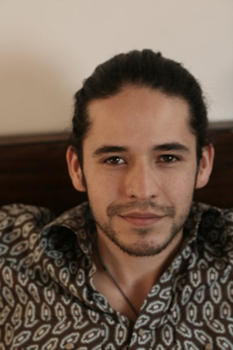 His picture book Pancho Rabbit and The Coyote: A Migrant’s Tale won the 2014 Tomás Rivera Mexican American children’s book award, and two honors for text and illustration from the Pura Belpré Award. Read more about Duncan on his official website. I grew up next to Westminister, CA in Seal Beach CA and I never knew about this! I relate! It’s amazing that a milestone of such importance isn’t more widely taught or discussed. Thanks for commenting! Thanks, Lila, for reviewing this book. Very important topic, and like Mia said in the previous comment, unknown to most people. Children books based on historical events are great, Readers enjoy the story and also learn about their history. The illustration with Sylvia shedding tears is emotional and effective. I like the illustration and reading from Duncan Tonatiuh he was inspired by ancient Mexican art. His style of illustration is perfect for animation movie. Great job! Is this book written in spanish?